The brief from Avalon included a experience that was mobile-first, clean, simple and easy to navigate. 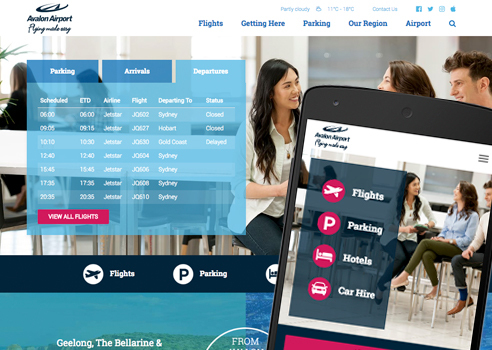 Core use of flights status and parking had to be integrated in to the home page. Custom components were required for intergration with various travel and aviation industry APIs. Also required on AWS EC2 hosting with double backups to Amazon S3. Cloudflare for DNS and DDoS protection and Serverpilot for server software updates and security. Monitoring by NewRelic, Statuscake and OpsGenie. Hourly duplication of site files and database via RSYNC to a second production enviroment for fast redundancy offshore if local hosting unavailable. Custom development of components for integration with Intersystems Flight Status API, WEGO hotel & flight booking API.